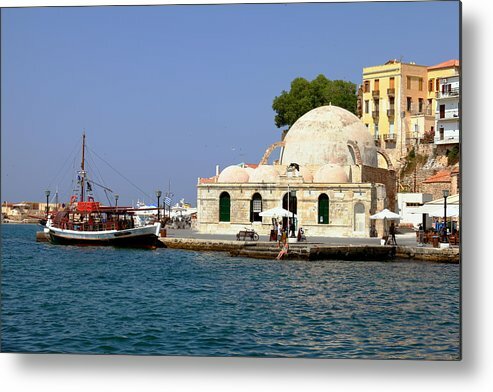 Janissaries Mosque And Caique In Chania by Paul Cowan - 10.000" x 6.625"
Janissaries Mosque And Caique In Chania metal print by Paul Cowan. Bring your artwork to life with the stylish lines and added depth of a metal print. Your image gets printed directly onto a sheet of 1/16" thick aluminum. The aluminum sheet is offset from the wall by a 3/4" thick wooden frame which is attached to the back. The high gloss of the aluminum sheet complements the rich colors of any image to produce stunning results. There are no comments for Janissaries Mosque And Caique In Chania. Click here to post the first comment. 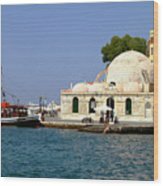 A view of the harbour in Chania, with the Janissaries Mosque and a caique used as a tourist ferry. Tourism in Greece was down 9% in 2010 according to figures released February 2011. PLEASE NOTE: Any watermark that is displayed will not appear on purchased prints. Paul is a professional art, travel, nature and food photographer working with both high-end digital and medium and large format film. He went into photography after a 30-year career in journalism in the UK and Middle East.